I am taking break from car building and decided to start the first of the flats/facades for the display shelf diorama. My brother-in-law is a hobby blacksmith. His "company" is Ridge Run Forge. He built his shop to look like an old timey shop. I thought it had the perfect look for my 1890's mining town main street. 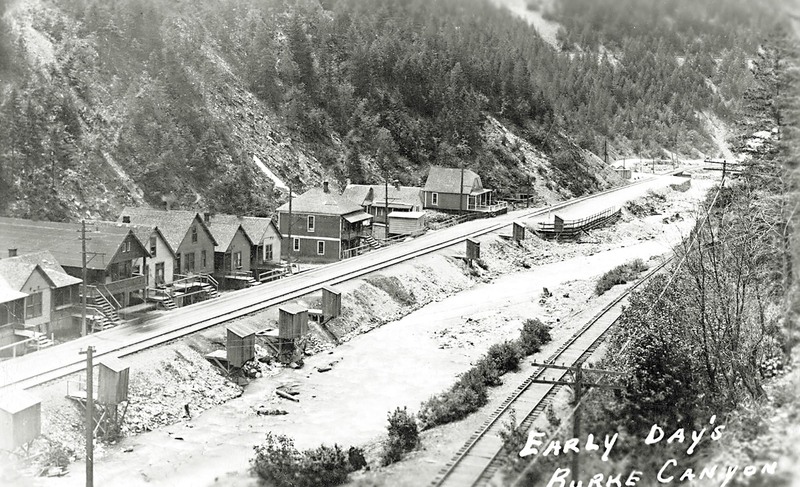 Burke Idaho was the terminus of the Coeur d'Alene Railway and Navigation Co. AKA Canyon Creek Railway. 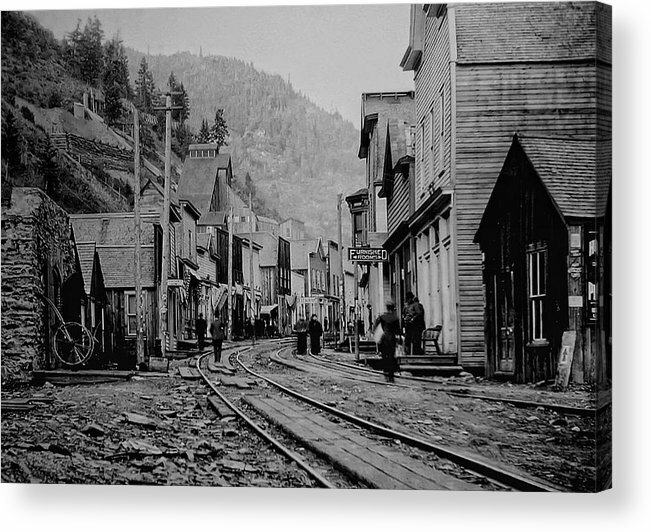 Burke was built in a very narrow canyon and the tracks and main street were one and the same. I will make the porch/walk stick out about 2" or 4 scale feet. The whole thing is going to sit on a raised platform unlike the photo and the walk will join all the buildings. Following Korm's suggestion I will make the building about an inch deep to give a little sense of depth and allow me set the picture of the interior back a ways for perspective. Any of you that are my Facebook friends don't mention this on there as it is a surprise. The historical photo will make a cool diorama. Dang it. And I was going to use that as a sign. Korm even made the suggestion to have the scene not be just a set of straight tracks in front of some straight buildings. He suggested as one option to make it on a curve. Well that would be a perfect idea and that picture is on a curve so its prototypical. Having the town on the outside of the curve will allow me to build the buildings on the end with a bit more depth also which I think well help with the overall feel. And on the inside of the curve allow me to put foreground detail, as he also suggested, so that the tracks are "in" the scene instead of "in front" of the scene. And in case anyone cares, the ruins of that stone building in the photo still exist today. Devon, do I see two sets of tracks in that photo or are my eyes just seeing things? Nope there is two. And at this point in history they are both standard gauge which means this photo was taken after 1890. One set is Northern Pacufic after they took over the narrow gauge. And the other is the Union Pacific. Eventually they were forced to share tracks through the canyon. Ya' know I was curious about that so I had to look it up. It doesn't say that they could not have moved into a rented old blacksmith shop in the early 40's but I suppose it's possible. Korm suggested near side details for the diorama. Canyon Creek had the nickname "****" creek. It lend itself well to nearside detailing. 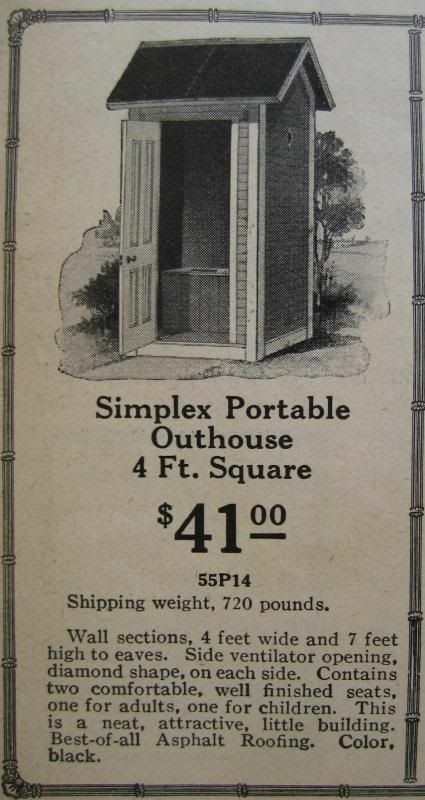 There must have been only one outhouse contractor in town. Devon, you must model the outhouses . That would be cool. Sear's catalog, the polished seat was a must! It still blows my mind that Sears is done! Who da thunk ! The Amazon folks sure are gonna miss them or maybe not as they never knew they existed. You can file teeth into the ends of brass tubing, various diameter to rough in knots, chuck in drill. Indoors, india ink stains, outdoor; pin nails. Jim this was exactly the process I was thinking of using unless someone had a better idea. I have used this technique to making streaking rust in HO and it works great. And likely will be how I do it. I will play with india ink as well and stain. But I am thinking the oil paints will give me what I want. That's an interesting idea David. That is certainly worth exploring. Thanks.